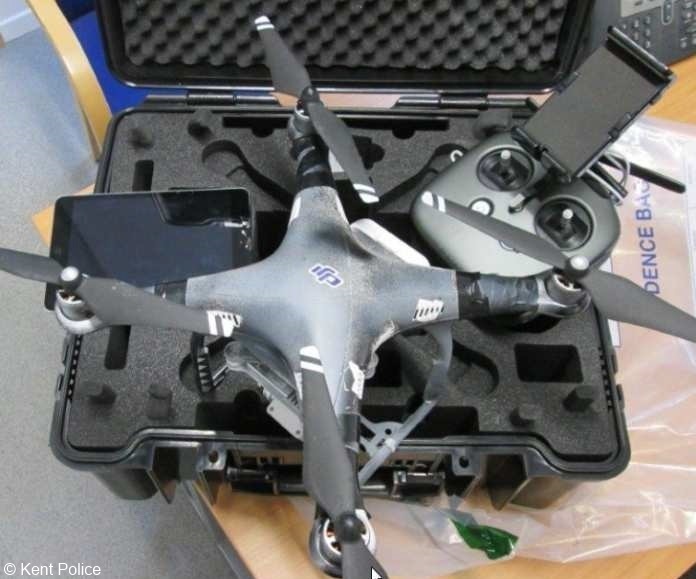 A London man has become the first person to be jailed for using a drone to send banned items into prisons including one in Hertfordshire. Daniel Kelly, 37 and formerly of Grove Park in London, has been sentenced to 14 months imprisonment for the offence, after admitting sending items, including spice, a psychoactive substance, and tobacco, into HMP The Mount Hemel Hempstead and two prisons in Kent. Kelly was arrested on 25 April after officers on patrol spotted a vehicle parked in Eastchurch Road, Leysdown. The lights were on but it appeared unoccupied. A person then ran into the front passenger seat and the vehicle sped off. It was later found in a holiday park in Leysdown and Kelly was arrested at the scene. The drone was found in the boot of the vehicle. In an attempt to avoid detection, it had been sprayed black - having previously been white. Black tape had also been placed over its lights. Flight data revealed that Kelly used the drone to send items into HMP Elmley on 20 April and into HMP The Mount on 24 and 24 April. He also used it to fly into HMP Swaleside on 25 April. Unsuccessful attempts to fly the drone into HMP Wandsworth were made on 17 April and 21 April. "Kelly's offending was serious. It shows a lack of respect for our justice system and it is appropriate that he has received a custodial sentence. Psychoactive substances and tobacco have an inflated value in prison and this can lead to offences being committed within. This places both inmates and prison staff at risk." "I am extremely proud of the work my officers have put into this case, from beginning to end. It was a good piece of instinctive policing to spot the suspicious behaviour that led to Kelly's arrest and everyone involved since has spent a lot of time paying attention to minute details linked to this case. As with all new offences, investigating this presented challenges that we have not come across before but the officers were able to corroborate all of the evidence and secure a conviction in a relatively short space of time."